The California Condor (Gymnogyps californianus) is a North American species of bird in the New World vulture family Cathartidae and the largest North American land bird. The condor is a scavenger and eats large amounts of carrion. It is one of the world's longest-living birds, with a lifespan of up to 50 years. Currently, this condor inhabits only the Grand Canyon area, Zion National Park, and western coastal mountains of California and northern Baja California. Although other fossil members are known, it is the only surviving member of the genus Gymnogyps. Condor numbers dramatically declined in the 19th century due to poaching, lead poisoning, and habitat destruction. Eventually, a conservation plan was put in place by the United States government that led to the capture of all the remaining wild condors in 1987. These 22 birds were bred at the San Diego Wild Animal Park and the Los Angeles Zoo. Numbers rose through captive breeding and, beginning in 1991, condors have been reintroduced into the wild. The project is the most expensive species conservation project ever undertaken in the United States. 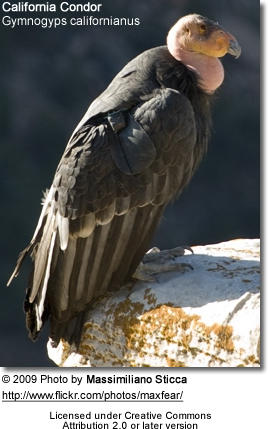 The California Condor is one of the world's rarest bird species. 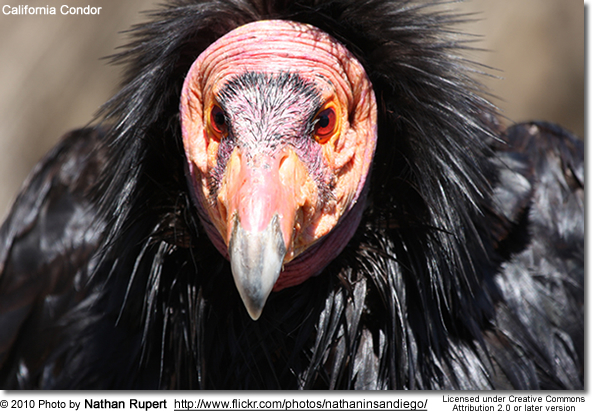 As of April 2009, there are 322 condors known to be living, including 172 in the wild. It is a large, black vulture with patches of white on the underside of the wings and a largely bald head with skin color ranging from yellowish to a bright red, depending on the bird's mood. It has the largest wingspan of any bird found in North America and is one of the heaviest. 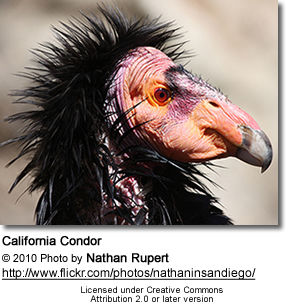 The California Condor was described by English naturalist George Shaw in 1797 as Vultur californianus. It was originally classified in the same genus as the Andean Condor (V. gryphus), but, due to the Andean Condor's slightly different markings, slightly longer wings, and tendency to actually kill small animals to eat, the California Condor has now been placed in its own monotypic genus. The generic name Gymnogyps is derived from the Greek gymnos/?????? "naked" or "bare", and gyps/??? "vulture", while the specific name californianus comes from its location in California. The word condor itself is derived from the Ecuadorian Quechua cuntur. The exact taxonomic placement of the California Condor and the remaining six species of New World vultures remains unclear. Though both are similar in appearance and have similar ecological roles, the New World and Old World vultures evolved from different ancestors in different parts of the world. Just how different the two are is currently under debate, with some earlier authorities suggesting that the New World vultures are more closely related to storks. More recent authorities maintain their overall position in the order Falconiformes along with the Old World vultures or place them in their own order, Cathartiformes. The South American Classification Committee has removed the New World vultures from Ciconiiformes and instead placed them in Incertae sedis, but notes that a move to Falconiformes or Cathartiformes is possible. The genus Gymnogyps is a prime example of a relict distribution. During the Pleistocene epoch, this genus was widespread across the Americas. From fossils, the Floridan Gymnogyps kofordi from the Early Pleistocene and the Peruvian Gymnogyps howardae from the Late Pleistocene have been described. A condor found in Late Pleistocene deposits on Cuba was initially described as Antillovultur varonai, but has since been recognized as another member of Gymnogyps. It may even have been a subspecies of the California Condor. Today's California Condor is the sole surviving member of Gymnogyps and has no accepted subspecies; although its range greatly contracted during the Holocene, the species always had a small and inbred population. However, there is a Late Pleistocene palaeosubspecies, Gymnogyps californianus amplus, which occurred over much of the bird's historical range – even extending into Florida – but was larger, having about the same weight as the Andean Condor. This bird also had a wider bill. As the climate changed during the last ice age, the entire population became smaller until it had evolved into the Gymnogyps californianus californianus of today. The adult California Condor is a uniform black, with the exception, especially in the male, of large triangular patches or bands of white on the underside of the wings. It has gray legs and feet, an ivory-colored bill, a frill of black feathers nearly surrounding the base of the neck, and brownish red eyes. The juvenile is mostly a mottled dark brown with blackish coloration on the head. It has mottled gray instead of white on the underside of its flight feathers. 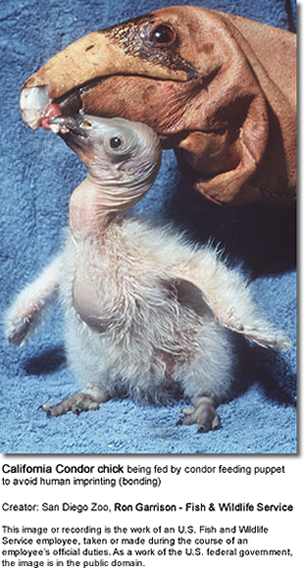 As an adaptation for hygiene, the condor's head and neck have few feathers, which exposes the skin to the sterilizing effects of dehydration and solar ultraviolet light at high altitudes. The skin of the head and neck is capable of flushing noticeably in response to emotional state, a capability that can serve as communication between individuals. The skin color varies from yellowish to a glowing reddish-orange. Contrary to the usual rule among true birds of prey, the female is smaller than the male. Overall length can range from 109–140 cm (42–55 in.) and the wingspan is 2.49-3 m (8.2-9.9 ft). Their weight can range from 7–14 kg (15–31 lb), with estimations of average weight ranging from 8–9 kg (18–20 lb). Most measurements are from birds raised in captivity, so determining if there are any major differences in measurements between wild and captive condors is difficult. Five hundred years ago, the California Condor roamed across the American Southwest and West Coast. However, due to their decline in numbers, the last wild bird was taken into captivity for the breeding program in 1987. 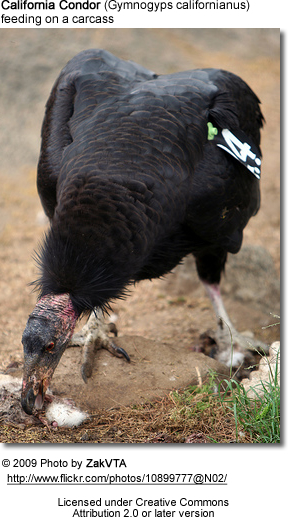 Recently, captive-bred condors have been released in southern California, in Baja California, and at the Grand Canyon. There are two sanctuaries dedicated to this bird, the Sisquoc Condor Sanctuary in the San Rafael Wilderness and the Sespe Condor Sanctuary in the Los Padres National Forest. These areas were chosen because of their prime condor nesting habitat. 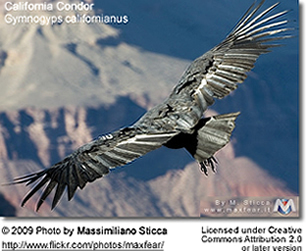 The condors live in rocky scrubland, coniferous forests, and oak savannas. They are often found near cliffs or large trees, which they use as nesting sites. Individual birds have a huge range and have been known to travel up to 250 km (150 mi) in search of carrion. When in flight, the movements of the condor are remarkably graceful. The lack of a large sternum to anchor their correspondingly large flight muscles restricts them to being primarily soarers. The birds flap their wings when taking off from the ground, but after attaining a moderate elevation they largely glide, sometimes going for miles without a single flap of their wings. They have been known to fly up to speeds of 90 km/h (55 mph) and as high as 4,600 m (15,000 ft). They prefer to roost on high perches from which they can launch without any major wing-flapping effort. Often, these birds are seen soaring near rock cliffs, using thermals to aid them in keeping aloft. The California Condor has a long life span, reaching up to 50 years. 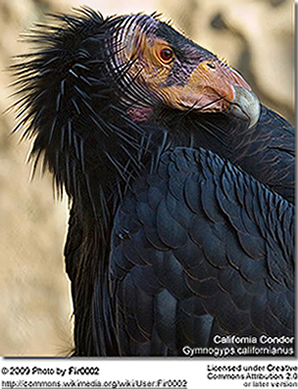 If it survives to adulthood, the condor has few natural threats other than humans. Their vocal display is limited to grunts and hisses. Condors bathe frequently and can spend hours a day preening their feathers. Condors also perform urohydrosis, or defecate on their legs, to reduce their body temperature. There is a well-developed social structure within large groups of condors, with competition to determine a pecking order decided by body language, competitive play behavior, and a variety of hisses and grunts. This social hierarchy is displayed especially when the birds feed, with the dominant birds eating before the younger ones. Wild condors inhabit large territories, often traveling 250 kilometres (160 mi) a day in search of carrion. It is thought that in the early days of its existence as a species, the California Condor lived off of the carcasses of the "megafauna", which are now extinct in North America. They still prefer to feast on large, terrestrial mammalian carcasses such as deer, goats, sheep, donkeys, horses, pigs, cougars, bears, or cattle. Alternatively, they may feed on the bodies of smaller mammals, such as rabbits or coyotes, aquatic mammals such as whales and California Sea Lions, or salmon. Bird and reptile carcasses are rarely eaten. Since they do not have a sense of smell, they spot these corpses by looking for other scavengers, like smaller vultures and eagles, who cannot rip through the tougher hides of these larger animals with the efficiency of the larger condor. They can usually intimidate other scavengers away from the carcass, with the exception of bears, which will ignore them, and Golden Eagles, which will fight a condor over a kill or a carcass. In the wild they are intermittent eaters, often going for between a few days to two weeks without eating, then gorging themselves on 1–1.5 kilograms (2.2–3.3 lb) of meat at once, sometimes to the point of being unable to lift themselves off the ground. Condors begin to look for a mate when they reach sexual maturity at the age of six. To attract a prospective mate, the male condor performs a display. In the display, the male turns his head red and puffs out his neck feathers. He then spreads his wings and slowly approaches the female. If the female lowers her head to accept the male, the condors become mates for life. The pair makes a simple nest in caves or on cliff clefts, especially ones with nearby roosting trees and open spaces for landing. A mated female lays one bluish-white egg every other February or March. The egg weighs about 280 g (10 oz) and measures from 90–120 mm (3.5–4.75 in.) in length and about 67 mm (2.6 in.) in width. If the chick or egg is lost or removed, the parents "double clutch", or lay another egg to take the lost one's place. Researchers and breeders take advantage of this behavior to double the reproductive rate by taking the first egg away for hand-rearing; this induces the parents to lay a second egg, which the condors are sometimes allowed to raise. The eggs hatch after 53 to 60 days of incubation by both parents. Chicks are born with their eyes open and sometimes can take up to a week to hatch from their egg. The young are covered with a grayish down until they are almost as large as their parents. They are able to fly after five to six months, but continue to roost and hunt with their parents until they turn two, at which point they are displaced by a new clutch. At the time of human settlement of the Americas, the California Condor was widespread across North America. However, climate changes associated with the end of the last glacial period and the extinction of the Pleistocene megafauna led to a subsequent reduction in range and population. 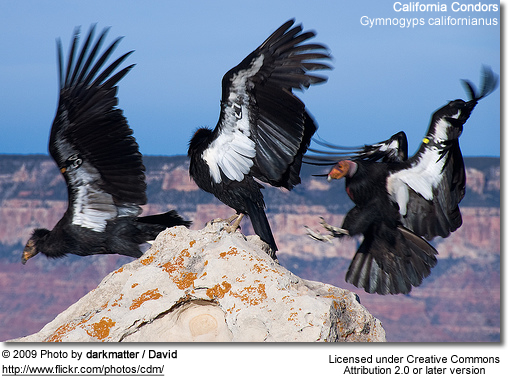 Prehistorically, California Condors are known from Arizona, Nevada, New Mexico, and Texas. In modern times, a wide variety of causes have contributed to the condor's decline. Its exacting mating habits and resulting low birth rate, combined with a late age of sexual maturity, make the bird vulnerable to loss of population. 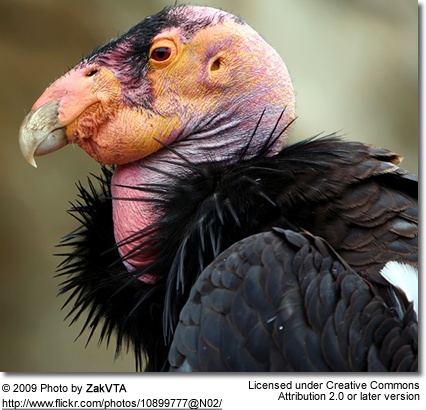 Significant damage to the condor population is also attributed to poaching, especially for museum specimens, lead poisoning (from eating animals containing lead shot), DDT poisoning, electric power lines, egg collecting, and habitat destruction. During the California Gold Rush, some condors were even kept as pets. In addition to this, cattle ranchers who observed condors feeding on the dead young of their cattle assumed that the birds killed the cattle. This fallacy led to the condor's extinction in some parts of the western United States. This belief was so deeply ingrained that the reintroduction of condors to the Grand Canyon was challenged by some cattle ranchers, who mistakenly believed that the bird hunted calves and lambs. As the condor's population continued to decline, discussion began about starting a captive breeding program for the birds. Opponents to this plan argued that the condors had the right to freedom, that capturing all of the condors would change the species' habits forever, and that the cost was too great. However, the project received the approval of the United States government, and the capture of the remaining wild condors was completed on Easter Sunday 1987, when AC-9, the last wild condor, was captured. There were only 22 condors in existence, all in captivity. The captive breeding program, led by the San Diego Wild Animal Park and Los Angeles Zoo, got off to a slow start due to the condor's mating habits. However, utilizing the bird's ability to double clutch, biologists began removing the first egg from the nest and raising it with puppets, allowing the parents to lay another egg. Unanticipated deaths among these populations occurred due to contact with Golden Eagles, power lines, and other factors such as lead poisoning. Since 1994, captive-bred California Condors have been trained to avoid power lines and people. Since the implementation of this aversion conditioning program, the number of condor deaths due to power lines has greatly decreased. Lead poisoning due to fragmented lead bullets in large game waste is a particularly big problem for condors due to their extremely strong digestive juices; this lead waste is not as much of a problem for other avian scavengers such as the Turkey Vulture and Common Raven. This problem has been addressed in California by the Ridley-Tree Condor Preservation Act, a bill that went into effect July 1, 2008 that requires that hunters use non-lead bullets when hunting in the condor's range. The California Condor conservation project is also the most expensive species conservation project in United States history, costing over $35 million, including $20 million in federal and state funding, since World War II. However, nesting milestones have been recently reached by the reintroduced condors. In 2003, the first nestling fledged in the wild since 1981. 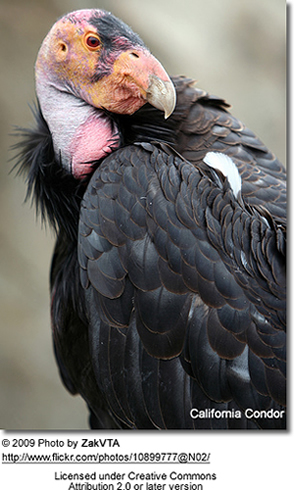 In March 2006, a pair of California Condors attempted to nest in a hollow tree near Big Sur, California. This was the first time in more than 100 years in which a pair of California Condors had been seen nesting in Northern California. In early 2007, a California condor laid an egg in Mexico for the first time since at least the 1930s. The population of the condors has risen due to these wild and also captive nestings. As of April 2009 there are 322 individuals living, including 172 in the wild and the rest in the San Diego Wild Animal Park, the Los Angeles Zoo, the Oregon Zoo, or the World Center for Birds of Prey in Boise, Idaho. The Wiyot tribe of California say that the condor recreated mankind after Above Old Man wiped humanity out with a flood. However, other tribes, like California's Mono, viewed the condor as a destroyer, not a creator. They say that Condor seized humans, cut off their heads, and drained their blood so that it would flood Ground Squirrel's home. Condor then seized Ground Squirrel after he fled, but Ground Squirrel managed to cut off Condor's head when Condor paused to take a drink of the blood. According to the Yokut tribe, the condor sometimes ate the moon, causing the lunar cycle, and his wings caused eclipses. The Chumash tribe of Southern California believed that the condor was once a white bird, but it turned black when it flew too close to a fire. Condor bones have been found in Native American graves, as have condor feather headdresses. Cave paintings of condors have also been discovered. Some tribes ritually killed condors to make ceremonial clothing out of their feathers. Shamans then danced while wearing these to reach the upper and lower spiritual worlds. Whenever a shaman died, his clothes were said to be cursed, so new clothing had to be made for his successor. Some scientists, such as Noel Snyder, believe that this process of making ceremonial clothing helped contribute to the condor's decline If so, this would be the only known species that was endangered by the California natives. Copyright: Wikipedia. This article and the photos are licensed under the GNU Free Documentation License. It uses material from Wikipedia.org ... Additional information and photos added by Avianweb.